Blue carbon is the carbon captured by the world's oceans and coastal ecosystems. The carbon captured by living organisms in oceans is stored in the form of biomass and sediments from mangroves, salt marshes, sea-grasses and potentially algae. It is considered to be more efficient in carbon sequestration than Green Carbon. UNEP Blue Carbon initiative aims to develop a global partnership to advance the sound management of coastal and marine ecosystem in order to ensure their carbon sequestration and storage functions are maintained, and emission of greenhouse gases are avoided. It also aims to include ecosystem based management of Blue Carbon Sinks into the global mitigation discussions and financing schemes. 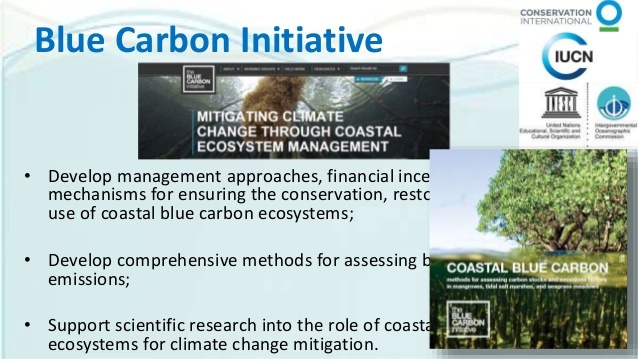 The policies for sound management of Blue Carbon Sinks are to be developed at global, national and regional level. 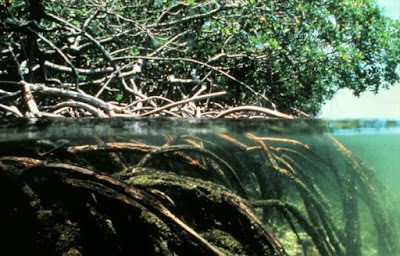 Mangroves are highly productive, biodiversity-rich, inter-tidal forest ecosystems adapted to survive in the harsh interface between land and sea. They perform a variety of roles viz socio-economic, bio physical, ecological, mitigating climate change. 3) They sequestrate carbon much more effectively than Tropical forests as they have nearly 5 times greater efficiency in capturing carbon than Tropical forests. This is in part attributed to the deep organic soil that they thrive in. 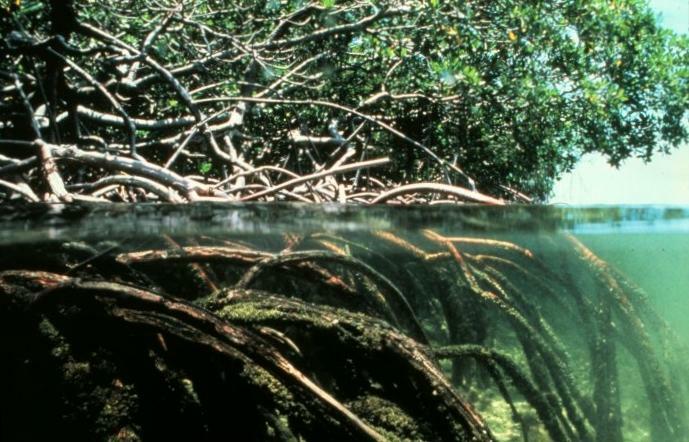 Entangled root system of the mangrove forests capture sediments and slow down tidal waters, allowing organic and inorganic material to settle down into sediment surface. The sediments beneath these habitats are characterized by typically low oxygen conditions, slowing down the decay process and rates, resulting in much greater amounts of carbon accumulating in the soil. In fact, mangroves have more carbon in their soil alone than most tropical forests have in all their biomass and soil combined. 4) Cutting down mangroves means releasing larger amounts of carbon into the atmosphere. This in turn causes the wet soil to dry up, leading to the release of even more stored carbon into the atmosphere. Estimates suggest a range of between 150 million to 1 billion tonnes of CO2 that is emitted annually due to the destruction of mangrove forests globally. Thus, at the global scale, coastal wetland destruction could account for 1-3% of industrial emissions; a number that is on the rise as more and more coastal wetlands are destroyed every year around the world. 5) Indirectly they help in mitigating climate change as they provide sustainable sources of livelihood for native population which can be an important driver for non expansion of industries etc in these parts of the world.